The story of a small group of Chinese flying aces in 1937 at the beginning of the Second Sino-Japanese War. The unsung air-warriors of the Chinese Air Force....... pre-Flying Tigers! Japanese air-supremacy at the outbreak of the war in the Pacific during World War II was a brutal surprise for Allied forces in the Pacific and south Asia, but it was no surprise all, just brutal reality for the airmen and unsung heroes of the Chinese Air Force, who have been in bloody combat with the air powers of the Imperial Japanese Army and Naval air forces from the summer of 1937, until the end of combat in the summer of 1945. In fact, contrary to popular belief that World War II began with Nazi Germany's blitzkrieg of Poland in 1939; World War II in China began with the full scale invasion by Imperial Japanese forces in July of 1937, with the flashpoint centered around the Marco Polo bridge in Beijing. 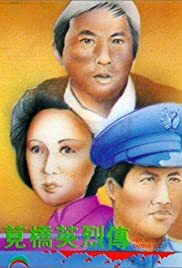 This movie begins it's real-life drama of the heart-wrenching events of late July - early August 1937, with the outnumbered Chinese Air Force squadrons scrambling from airfields and training bases inland, to the huge war front at China's eastern coastline. Viewers will immediately get acquainted with the young 29 year old Colonel Kao Chih-Hang (spelled "Gao Zhihang" in standard Pinyin), whose life is not just his skilled bio-mechanical union of his body to his flying war machines, but also a trial-by-fire for the love of Rongran, the woman he is married to; the woman who naively wants his ever dissipating companionship in the torment of war. Colonel Kao bore great responsibility for the safety of his men and success of the missions against overwhelming odds, and the incredible massed firepower of the Imperial Japanese war machine. Inspite of the adversities facing the Chinese pilots whose increasingly outmoded American-made fighter aircraft (primarily the Curtiss Hawk III's as accurately portrayed in this movie) and skilled veterans still alive to operate them, the Chinese airmen courageously battled the invaders who possess the advantage of higher-technology, better training and sheer numbers; nonetheless, causing much bloody casualties and losses against the mighty Imperial Japanese armed forces on air, sea and land. But it was to be a war of utter bloodshed and attrition for the brave Chinese pilots whose only desire is to engage the enemy, shoot them down, strafe them, bomb them and sink them. It was their absolute commitment to ridding their homeland of the aggressors. Also introduced to the viewers are Chinese Air Force war heroes and ace fighter pilots (standard Pinyin) Major Liu Cuigang, Lieutenant Yue Yiqin, Lieutenant Yen Haiwen and others. Unsung heroes whose place in history have been effectively ignored through less-than-wholesome accounts of air combat history in Asia. The same type of ignorance, if I may add, that caused the bloodying and bullying of Allied air powers following the attack on Pearl Harbor. Men and equipment of the Imperial Japanese war machine that had itself faced great adversity beginning 4 years prior to Pearl Harbor, and whose continuous engagement with the Chinese Air Force helped hone their death machines and killer instincts to near perfection. The Mitsubishi A6M "Zero" fighter was an advanced air superiority fighter development bourne directly out of the fighting experience against the Chinese fighter aircraft and other targets over the vast distances of China. The predecessor of the "Zero", the Mitsubishi A5M "96", is well showcased in this movie during the Imperial Japanese struggle to wrest air supremacy from the Chinese Air Force. Top "Zero" pilots and Chinese air war veterans such as FSgt Saburo Sakai, Warrant Officer Hiroyoshi Nishizawa and Lieutanent(JG) Tetsuzo Iwamoto would go on to claim 64, 108 and 120 aerial kills respectively; with most of those kills registered against American Army and Navy fighter aircraft. NOTE: Lieutenant(JG) Tetsuzo Iwamoto personally claims at least 202 aircraft shot down from his initial air combat days beginning in 1937, through the Japanese home defense in 1945, but this figure has been largely disputed. Most of the battle scenes in this movie are remakably well done, and is a special-effects tour-de force unlike any other Chinese made films of its time; thanks to much apparent technical expertise drawn from the Japanese cinematic pros who worked behind the scenes in the Godzilla series of films. Many of the scenes were not special effects at all, but actual military footages that certainly enhances the battle scenes!